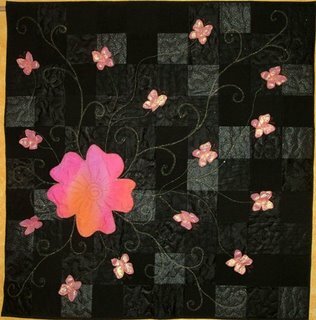 This is the quilt that I entered into the Down Under Quilts 100 competition. The theme was, of course, one hundred. I thought long and hard about what one hundred meant to me, but…nothing. So eventually I went to a quotations website and typed hundred as my search word. I found a Chinese proverb which said, One joy will shatter one hundred sorrows. Isn’t that fantastic! It made me think about how a hug from a tiny person in your life makes all you worries melt. 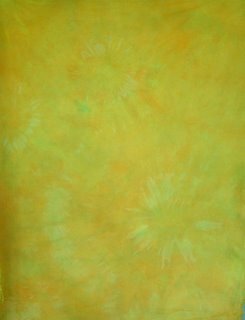 I used one hundred four inch squares to represent the sorrows. They are black in a range of textural fabrics – suede, organza, tafetta, silk, satin and polyester. 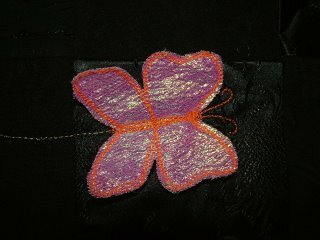 The enormous flower represents one joy and the dimensional butterflies – organza on netting – are spreading the joy. Yesterday the quilt arrived home. It wasn’t a winner in the competition. Tomorrow is my mother-in-law’s birthday. She genuinely admired this quilt when I was making it. The timing of its arrival means that this will be a birthday gift for her! Saves me facing the shopping centres! This week from Thursday through to Sunday is our craft show. It is supposed to serve as the craft show for the whole region – North Queensland, but this year it is disappointing. I am sorry to say that it has not been well organised or advertised. Lots of ladies didn’t even know it was on until just days ago. That is not enough time for ladies in remote centres to organise a trip to Townsville. It is very small – about half the size of previous years. I hope that it won’t be the last craft show in our area. There is already talk of a break away group organising their own show. I guess time will tell. 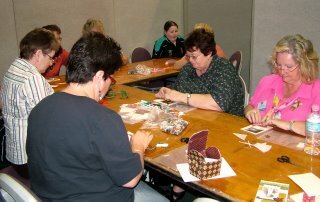 I am running one workshop and one demonstration each day. My workshop is making a postcard using christmas images printed onto fabric with lots of lace and button embellishments. It is a nice marriage between fibre arts and scrapbooking, as we are making a fabric collage. Below is a photo of my ladies working hard today. Don’t you love that moment in a workshop when everyone is so immersed in their creativity that a silence descends on the group! Look at the focus on all of these faces. This is really my whole workshop room. It was supposed to hold twenty people! I wouldn’t like to be squeezed in there with nineteen others! My demonstration each day has been of quilt as you go techniques. 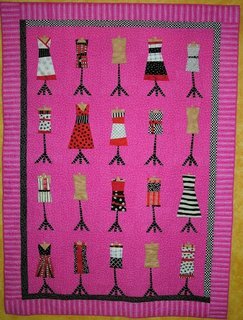 I have been making up a ‘mock quilt’ with tiny blocks and a border each day. I use it to demonstrate free machine quilting. Each day I have had a full house – about thirty ladies. I have received lots of positive feedback, which makes it all worthwhile! 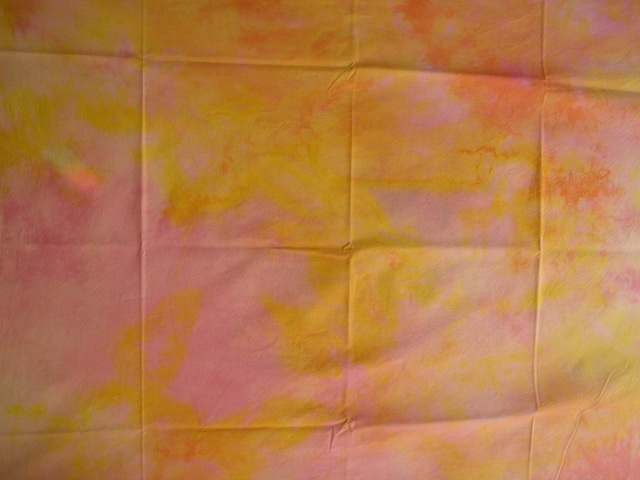 A few weeks ago Flo and I began to experiment with hand dying fabric. The very next day I recieved a phone call inviting me to hold a table at our local Christmas market. This must be fate, so naturally I agreed, and with just five weeks to get ready we found ourselves very busy. This week we have dyed sixty-five metre pieces of fabric.My husband and daughter have cooked all meals, my mum has helped out with ironing our fabrics, and everything else has had to wait. Mind you, I still managed to machine quilt two client quilts. It’s really just housework that has to wait! Here are two of our pieces which I love. Is it wrong to hope that no one will buy them? Probably should have pressed the creases out of the second one…sorry. Here is a close up of the dress that interested you. It is my sister’s favourite too. 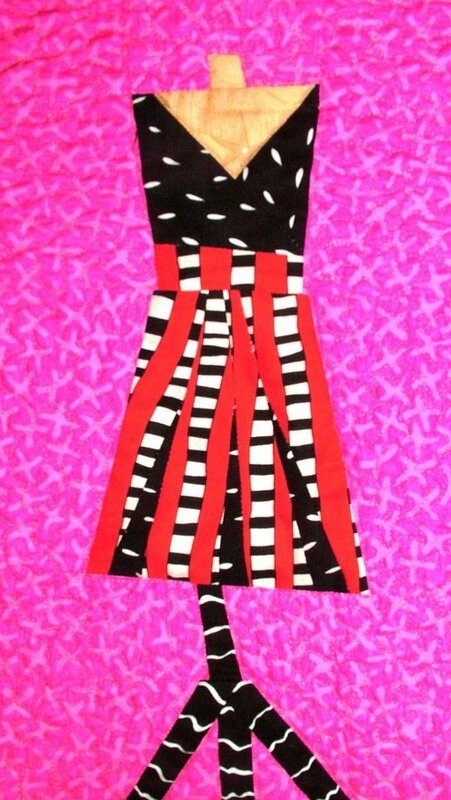 She wants to take this image to a dress maker and have one made to wear on special occasions!! Last week my daughter (my eldest child) turned sixteen. I am really not sure where all that time went, nor am I sure that I could really be old enough to have a sixteen year old child! She went to leadership camp just a few days after her birthday and while she was gone I made her this quilt. 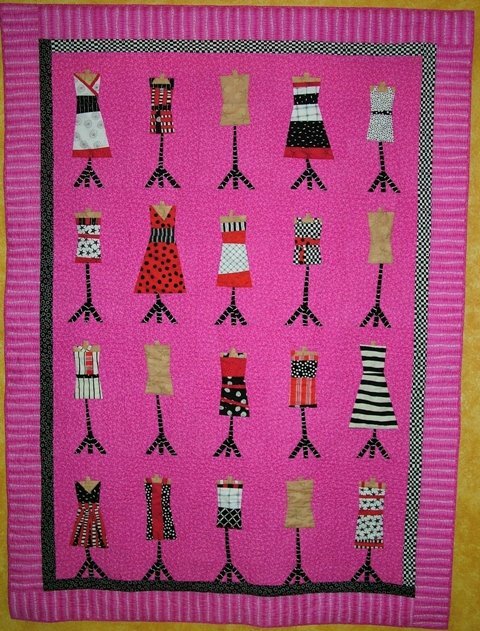 This is a Jan Mullen pattern called dressez. Thanks Jan and Sally for the kit that you sent. I was really pleased with the red ‘hightlights’ to the dressez. I am sure that I owned some of these dresses during the 1980s. 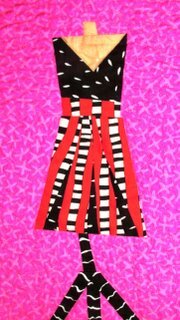 I know that I made myself a red with black polka dot number for a wedding around 1988. Beautiful! It seems odd to have my work descibed as traditional – I know that I hover around all quilt styles without specialising in any particular genre. I don’t think of myself as traditional. Although in this project I was experimenting with shapes that gave a traditional result. I am looking forward to the magazine when it is published in November. This is my entry to the local quilt competition which has the theme of ELEMENTS. It is called Kyoto as a political comment about energy. The red squares along the left hand side have a Japanese script printed on them. This is a lovely coincidence. I just liked the contrast of the red against the other colours. 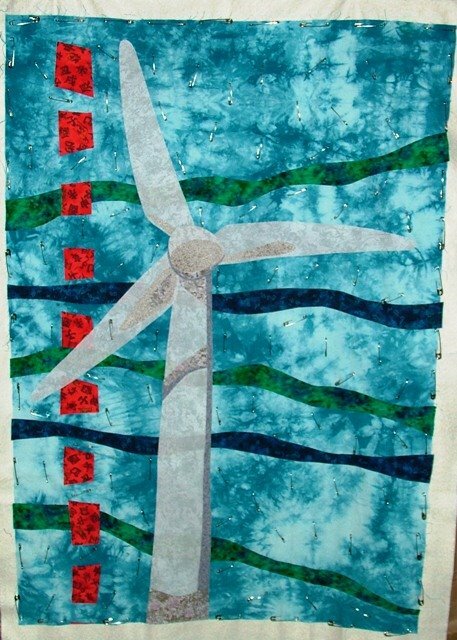 When I showed it to my quilting friend Jenny she asked “Did you choose the red fabric as a comment about the Kyoto protocol?” This is an issue which is close to her heart. Her daughter is actively involved in raising awareness around global warming issues. It sounded good to me, I was trying to make a comment about elements and energy from elements. So the quilt is now called Kyoto. I really enjoyed making this quilt. I was quite impulsive in my processes. I just cut the shapes that I wanted from fabric already attached to fusible web, without any drawing, just visualising and cutting. I am sure that I will use this process a lot more for my own art quilts. No patterns! This photo has been taken prior to the quilting, which is quite heavy. I will take another photo when it is hanging at the exhibition.